Comic books are a rich source of stories and, more importantly, money for the all-consuming Hollywood machine. They provide more grist for the mill, and come with a pre-built fan base; a high concept; and a marketing angle which pretty much runs itself, all drawn from the form of the original source material. But, as ever, the well of ideas is not bottomless. The A-list men and women in tights - Superman, Batman, The X Men, Spiderman and The Hulk - have pretty much been plundered by the film industry. Naturally, the studios won’t let this stand in their way, and so they’ve turned their attention to the lesser heroes, no less great, but less well-known. Daredevil, Catwoman, Elektra the Assassin, The Punisher, The Fantastic Four, and Hellblazer (soon to be released as Constantine) all fall into this category, along with Mike Mignola’s Hellboy. As with most comic strips, the Hellboy story is high concept: in 1943, Hitler and the Nazis were changing the direction of World War II. Fascinated with the occult, Hitler and his Nazis decide to bring in outside help, from “the beyond”. Luckily for us, the ritual which was to bring about the arrival of demonic overlords, and swing the war in Hitler’s favour, was thwarted by a group of marines and a scientist of the paranormal. When the dust settled, the marines found a small baby demon, which they took as their own, and named Hellboy. Spring forward sixty years and now a fully-grown Hellboy, along with other “freaks” such as fish man Abe Sapien and pyro-kinetic Liz Sherman, are the secret weapons in an ongoing war with the paranormal threats to this world. Now, as a few duds in the past have proven, high concept doesn’t necessarily mean great film. Just check out Superman 4 or Batman and Robin for proof, if any was required. So, how does Hellboy fare? 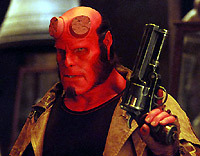 Well, it’s immediately apparent how faithful the film is to its source, not only in look, but also in story and script, Hellboy creator Mike Mignola wrote the story and the screenplay, which immediately gives the film a authentic feel, and will certainly appease fans of the books because any changes are Mignola’s to make. The look of the film is lush and sumptuous, which is only to be expected from a director such as Guillermo del Toro who has an eye for atmosphere, as demonstrated in films like Mimic and The Devil’s Backbone. The film also ticks all the right boxes, with the almost painfully obvious casting of Ron Perlman as the titular Hellboy, along with the excellent makeup work on Perlman and Doug Jones as Abe Sapien, by FX maestro Rick Baker. Both characters look as if they have been physically lifted from one of the comic’s frames, with barely a single concession to the usual Hollywood attitude for amendments to make the film appeal to every demographic. 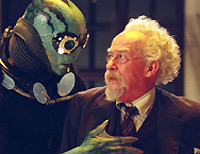 The acting is a varied affair with fine turns from John Hurt as Hellboy’s “father” and, considering the ton of makeup he is under, Perlman also hits the right notes. 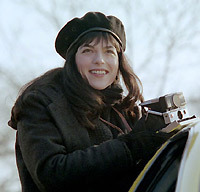 The rest of the cast lets the side down somewhat, with the worst offender being Selma Blair as the object of Hellboy’s affections, Liz Sherman. Her turn is so flat and dour that it is rather hard to grasp what Hellboy actually sees in her, beyond the fact that she is probably the only major female character in the film. That accusation can not, however, be levelled against Karel Roden who, as the movie’s main villain, Grigori, wobbles between cool, slimy bad guy, to goggle-eyed scenery-chewing madman, but never truly exudes any feeling of menace. Del Toro, for all of his beautiful photography, and obvious love of the subject matter, never shows that he’s in control, so what you end up with is film that’s glorious to look at, and immensely quotable, but which fails to push the one button that all comic book movies must hit if they are to do well: the excitement button. Hellboy is not one of the worst comic book adaptations, but neither is it the best. Sadly what it does do is give more ammo to the Hollywood studio’s argument about not sticking slavishly to the source material.